Doesn’t this shirt remind you of those tablecloths in Italian restaurants? Well, it reminds me of them and I am running out of descriptors for Sam’s plaid shirts. 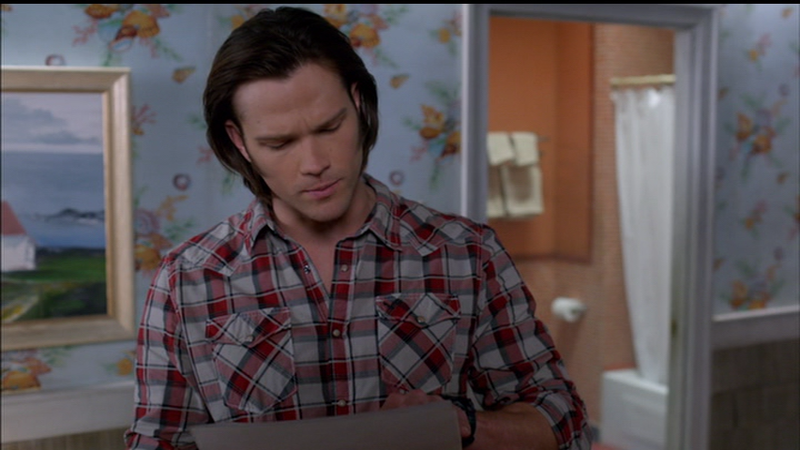 This shirt is red and white plaid in a similar style to Sam’s Gold, Blue, and White Plaid from S6. It’s cut in the western style and does up with snaps, as is Sam’s usual. In Of Grave Importance (7x19), Sam wears this shirt from when he and Dean go to the restaurant to meet Annie until the end of the episode. In Goodbye Stranger (8x17), Sam wears this shirt from after they rescue Meg until the end of the episode. In Alex Annie Alexis Ann (9x19), Sam wears this shirt from when he and Dean arrive in Sioux Falls until they escape the vampire nest after Jody saves Alex. In Black (10x01), Sam wears this shirt when we see him researching in the Bunker at the beginning of the episode. In There’s No Place Like Home (10x11), Sam wears this shirt at the beginning of the episode when he eats egg white omelettes with Dean until the leave the Bunker to go try to find Charlie. He briefly wears a suit, and then changes back into this shirt while he and Dean drive to the next location, where they once again put on suits. In Angel Heart (10x20), Sam wears this shirt from the beginning of the episode until Claire’s mother dies. In The Bad Seed (11x03), Sam wears this shirt from when he and Dean try to capture Rowena outside her hotel, until the end of the episode. In All in the Family (11x21), Sam wears this shirt when he and Dean go to meet Metatron. In American Nightmare (12x04), Sam wears this shirt after they visit the family, and Sam decides that Magda’s ghost must be haunting them and goes back in to investigate. 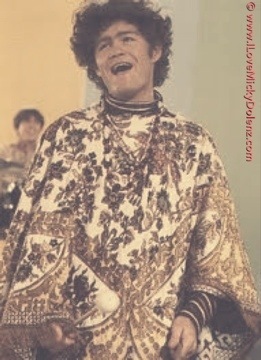 He wears it for the rest of the episode. LOL! I love the names too. I wonder if the reason Sam has so many shirts is because Jared's size keeps changing every season! I'm not sure why Sam has so many shirts. I don't think it's necessarily because of Jared's size, since there is ONE shirt that he's actually been wearing since S1. I'm wondering if maybe it's because Jared steals a lot of Sam's shirts from wardrobe and they end up in his closet? Or maybe he's rougher on the shirts and destroys them off camera? I really have no idea. But maybe the cut of the blue plaids is less able to drape well over muscles that change or something..? He very well may have been. There's a guide to con-clothes out there, don't by Mostly10 on tumblr. I have to go through it for the S7 clothes, but I HAVE marked some clothes in this catalogue as having appeared in Cons.